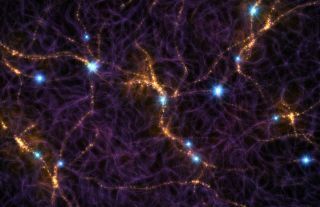 This artist's illustration shows part of the cosmic web, a filamentary structure of galaxies that extends across the entire sky. The bright-blue point sources shown here are the signals from fast radio bursts (FRBs) that may accumulate in a radio exposure lasting for a few minutes. The radio signal from an FRB lasts for only a few thousandths of a second, but such bursts should occur at high rates.